Brackets and Jam South returns to Kincumba Mountain on Friday, November 3 ,for another night of music, food and friendly company. Scene Stealer will start the evening’s lineup from 7:30pm, following by Doctor Goodvibe at 8:15pm. The first Drum Jam for the evening will commence at 9:15pm. Short n Curly will take the stage at 9:30pm followed by the second Drum Jam at 10:30pm. 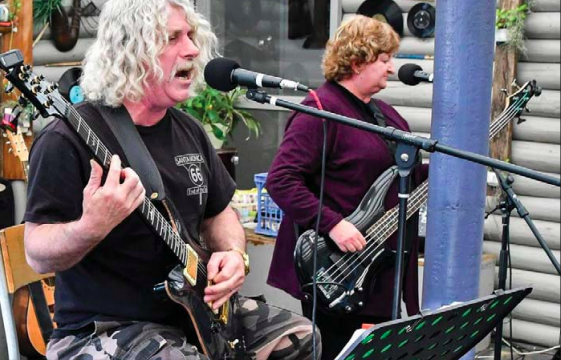 Local band Scene Stealer have been together for two years and are developing a serious following in the pubs and clubs with their porch style blues and rock music. Fronted by the renowned and charismatic vocalist, Muma Jane, Scene Stealer has a kick-back, raw, energetic style. It features guitarist Ben Hogan, drummer Denis Hodges and blues harpist Matt McLeod. Dr Goodvibe (Edu Valk and Christian Marsh) play Australian, original, contemporary blues and roots music with elements of funk, reggae, jazz and folk. They combine Edu’s acoustic guitar grooves, with persuasive percussion and Chris’ electrifying diatonic and chromatic harmonica. Multi-Award winners, they deliver upbeat colourful music. Edu Valk is a unique and diverse Australian singer songwriter whose philosophical and often satirical commentary on life openly elucidates his heart. Christian Marsh has made the harmonica his life’s work. Starting at the age of 14, he has studied the instrument with serious dedication, in a never-ending quest for perfection. He has played every idiom, from country and blues to jazz and classical, he played for many years with artists and bands across wide cross section of music styles. Originally from the Hunter Valley, Short n Curly moved to the Central Coast 18 months ago. They enjoy playing music from the 60s to the 90s as well as their own originals, and released an Album of originals in 2016. Peter Moore has played lead guitar for many years in various rock bands around the Hunter Valley. His wife Del has played bass guitar in this outfit for the last four years, performing live at a multitude of venues. Paul Parsons will be the drummer for the night, an accomplished drummer who has played for many years.